Book your on-site group training session with the Red Cross. Call us or fill out the form below. We're here to help. Create a safer workplace with OSHA-compliant training from American Red Cross safety experts. The Red Cross can help with flexible training solutions designed to fit your organization, meet your corporate guidelines, and stay within your budget. Whether it’s required by OSHA, part of your company policy, or you simply want a safer workplace, the Red Cross has First Aid, CPR, AED and other training solutions for you. An expert Red Cross Instructor comes to your location, supplies all the equipment and delivers the training to your employees at a date and time that is convenient for you. This is our most popular option for safety training. Learn how someone on your staff can deliver Red Cross training to your own team by becoming an Authorized Service Provider. Red Cross. The Right Choice for You. For more than a century we've prepared individuals and organizations to be ready in an emergency. OSHA compliant training that can be customized to meet your corporate guidelines. 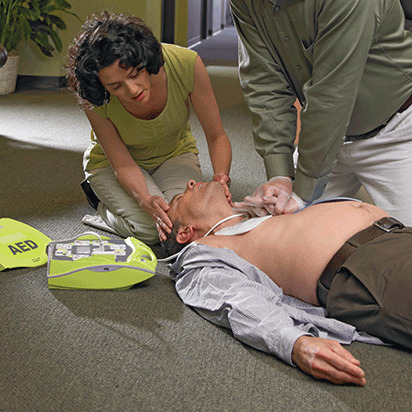 Each year millions are trained in First Aid, CPR and AED safety, resulting in lives saved at home, business and school. Is there a minimum number of people required for on-site group training? Yes, the billing minimum is 8 people. If you have less than 8, call us at 1-800-567-1483 and we can help you register for training in your community. We're ready to go with On-site Training. What's the next step? Fill out the form or give us a call at 1-800-567-1487. My team is already trained, but we need to be recertified. How can we do that? Getting employees recertified is easy, with most recertification classes being shorter than the initial training. Call now (1-800-567-1487) before your employees’ certificates expire. In addition to OSHA compliant certificates, you will have access to free digital materials and mobile apps. Are there any new products available to aid in my teaching or taking a class? The Big Red™ LightSaving Manikin is a simulation experience offered for CPR education. It provides LED technology that mimics blood flow through the body and brain to give instant visual feedback on technique. including disaster relief, blood collection, and services to the Armed Forces.